The schtick, if you're unfamiliar with it, is that every day they put up one deal, usually a good one. Sometimes it's only ok, sometimes it's fantastic, but whatever it is, it's only one thing, and it's only for that one day. Predictably, on most days it's not going to be anything you want or need, but occasionally it's going to be just what you want at just the right price, and that's kind of magical when it happens. So far, Loot has been a mixed bag. There have been a few cool things I didn't need (like Gamer Paper and Iron Tyrants) but mostly it's been games I've never heard of and don't care much about. But today, they knocked it out of the park, and are offering such a great deal that I decided it was worth dedicating today's post to. Today's deal, if you haven't already gone to check, is a bundle of the Dying Earth RPG and two of its core supplements (The Kaiin Player's Guide and The Scaum Valley Gazeteer), in print, for $15. That is a jaw droppingly good deal, so much so that I regret that I already own all three books. 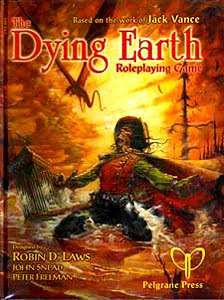 For the unfamiliar, the Dying Earth RPG is a Robin Laws game (which, for me, is enough to sell it all by itself) based on the novels of Jack Vance. It is baroque, colorful and magical play with an emphasis on wordplay and style that is very much in the style of the source material. A generic version of the system is floating around out there as Skullduggery, and it's slick, but there's something fantastic about the source material that streamlining loses. Anyway, this is a great deal, and if you're reading this today, I hope you take advantage of it. Totally worthwhile. Very cool. I hope they can work out a way to ship things a bit more cheaply in the future, though. It's still a decent deal, but paying $12 in shipping on a $15 purchase is the sort of thing that makes me take a long step back and strongly reconsider whether or not I'm going to continue to checkout. Nocker, we had to restrict this to the continental US at the request of the publisher. It was such a great deal, though, we couldn't resist. S&H is one of those things we're learning a LOT about with Loot. I never knew how varied and complex it gets when you decide to send stuff all over the world. We're getting a huge education!